Boyfriend is a Disney FANATIC. His retirement dream is to work at Epcot. Doing what? Night time trash collection. This way, he gets to roam the streets of Epcot when no one else is there, and just enjoy the scenery. Talk about aspirations! Ha! Well until that day comes, he will continue to visit 4-5 times a year. Yes, 4-5 times a year, 3-4 nights each time. It’s a little much for me, but it is Disney, so you can’t hate. Disney world, the most magical place in the world, has abysmal sushi! Teppan Edo, though decent habachi, and Katsura Grill, though decent noodles, both has garbage sushi. Quality lower than you would find at your local grocery store. That was what we had to endure every time we went to Disney. That is until Morimoto opened back in 2015! It’s not in Epcot (where we stay), but it’s only a 15 min Uber, so not far at all. The space is amazing, I would even go as far as to claim, grander than Morimoto NYC (which I’m not at all a fan of), and the flagship Morimoto Philadelphia (which I’m a HUGE fan of, but not for sushi). 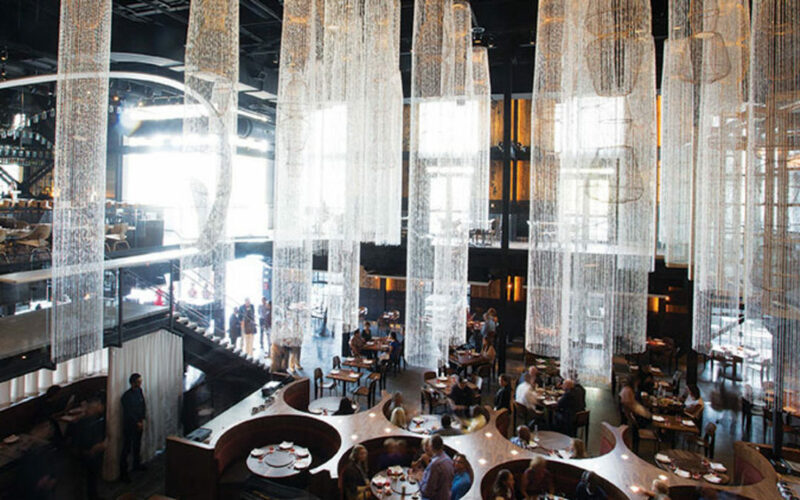 The sushi bar is on the second level, where you really get to appreciate the opulent chandeliers. Go between Tuesday and Friday. Unlike most sushi-yas in NYC where we get fish up to 6 days a week, Morimoto Disney only gets deliveries from Japan Tuesdays and Thursdays. That’s like NYC 10 years ago! We tend to just walk in, but reservations are super easy, and probably even easier at the sushi counter. 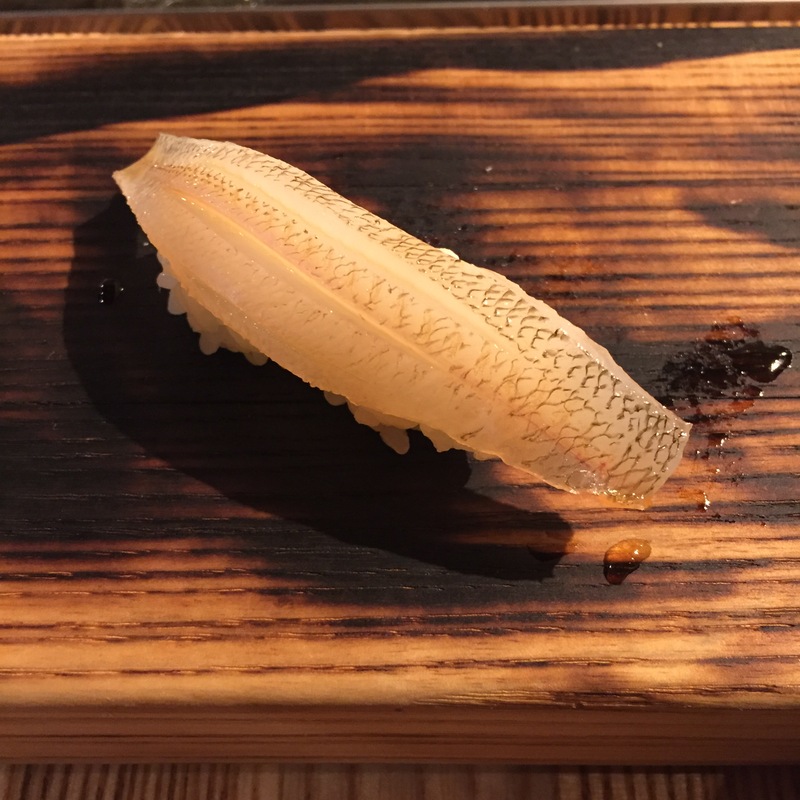 We never did, but supposedly, you need to reserve in advance if you are looking for an omakase course. Tonight, we sat with chef David Tsa. I ought to note, he’s not Morimoto Disney’s head sushi chef, but he was still very good, and not far from our last meal, which was with their head chef. So I can still claim that this post will be indicative of what you should expect, head chef or not. 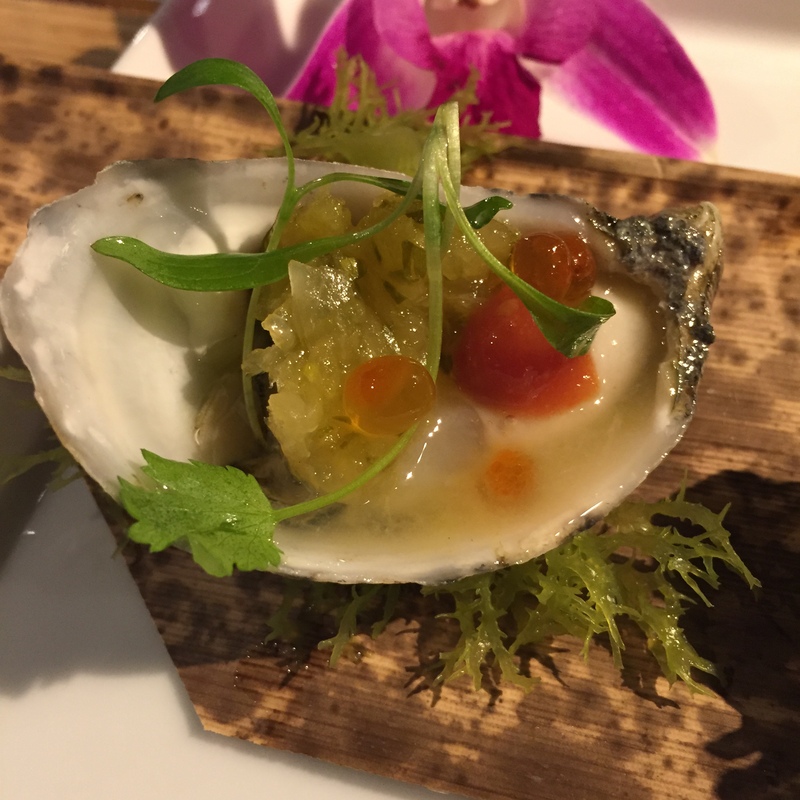 Shigoku Oyster – Chef David served this with pickled radish and IKURA (salmon roe). 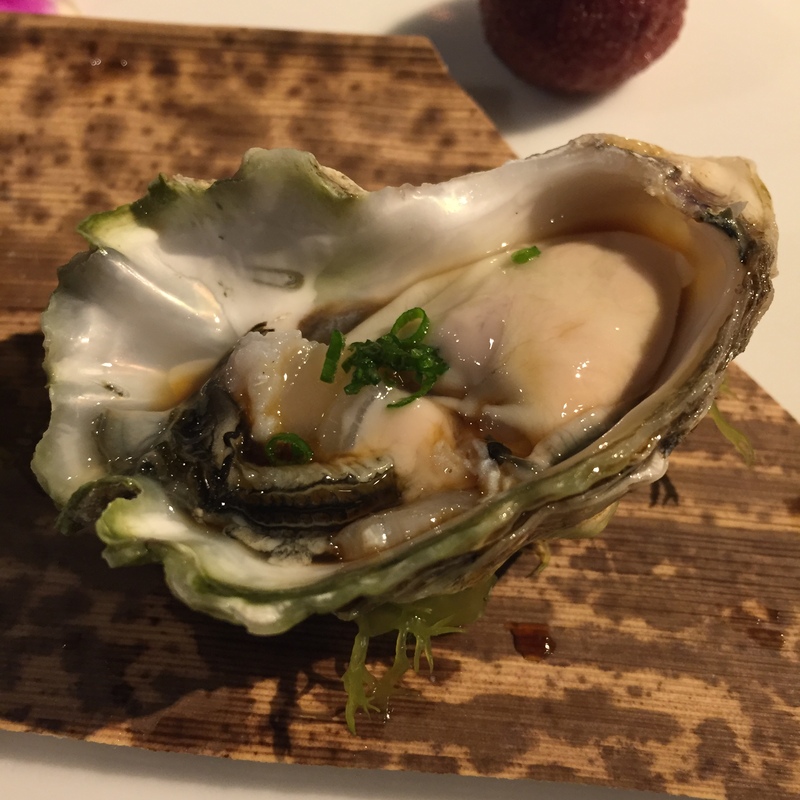 The oyster itself was good, firm and meaty, very sweet, but the combo was an overkill. The pickled radish was ridiculously sour. Despite wiping off ALL the pickle before indulging, it was still a bit sour. Kumamoto Oyster – Served simply with a hint of ponzu and topped with chopped scallions, allowing the flavors of a great Kumamoto to really shine through. Simplicity is bliss. 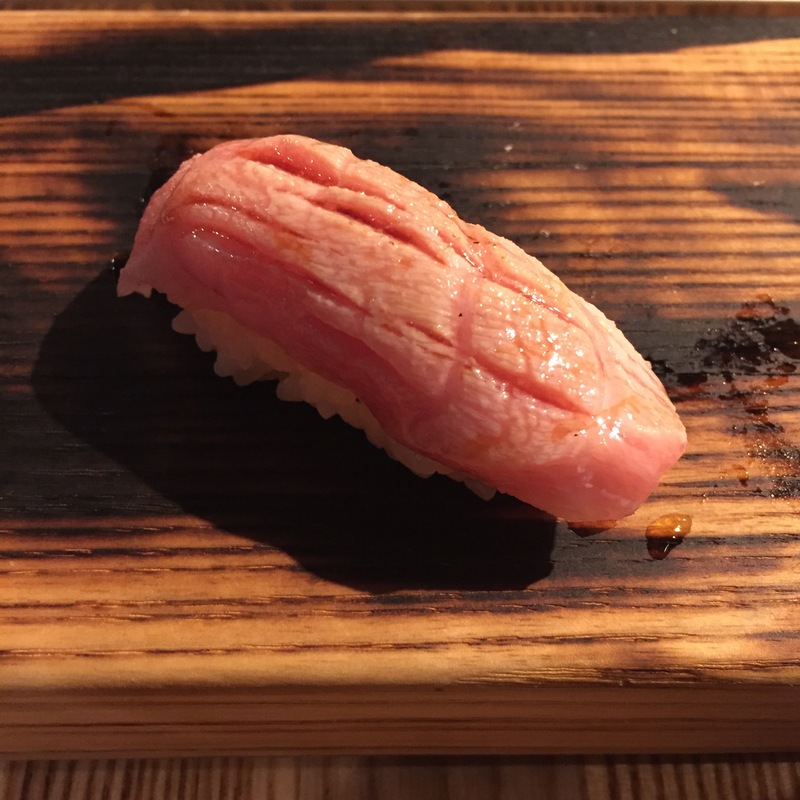 Toro Handroll – Toro with deep fried Takuan and chopped scallions. I don’t know that I agree with deep frying the Takuan. I get why they fry things like garlic chips, and onions, it adds texture, and really brings out the flavor. Takuans however, are already naturally crunchy? 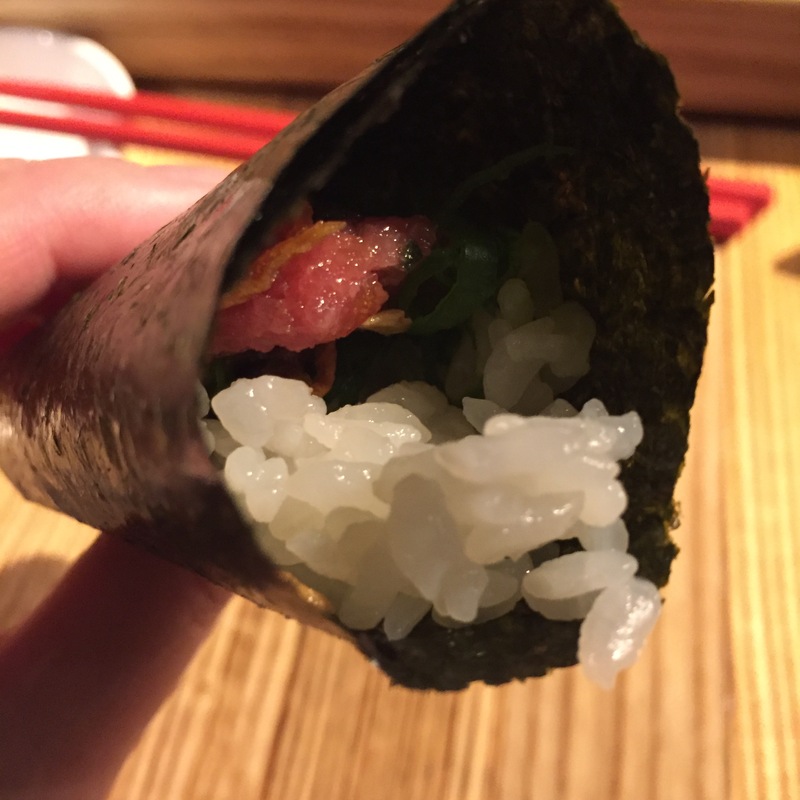 This was a very, very good handroll, but why would a handroll be my first sushi serving? 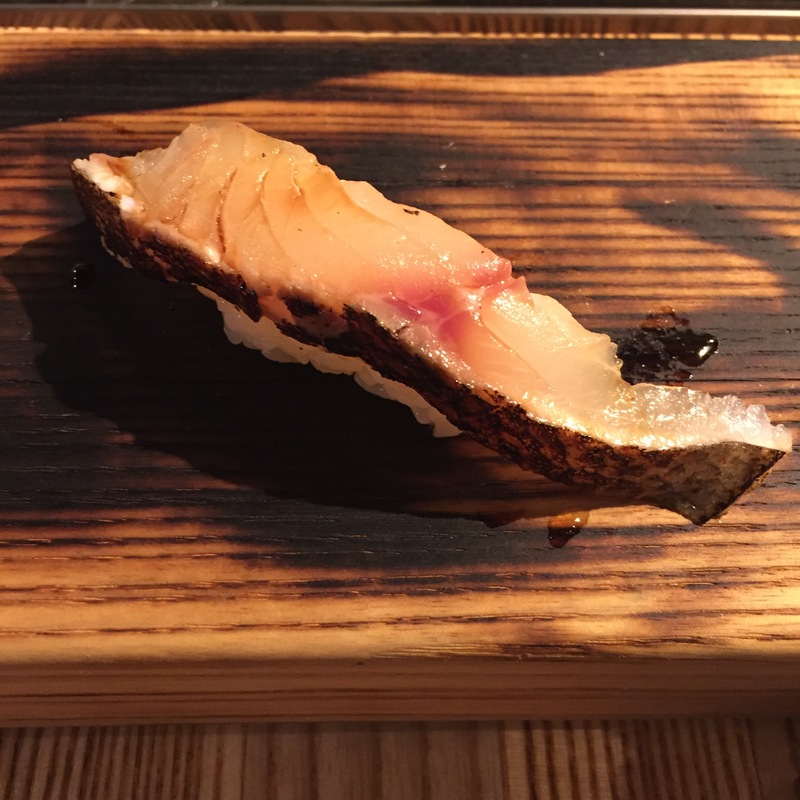 KINMEDAI (Golden eye snapper) – YUM! You really can’t go wrong with a KINMEDAI, but the sequencing is just odd. Starting off with a TORO, then a super decadent white? How do you follow that??? Lionfish – See? If you started with the Lionfish, I would be much more forgiving. If you start with two super heavy hitters, then follow with this really mild, unimpressive fish, you’re not doing yourself any justice. Morimoto Disney loves serving this fish, comparing it to Grouper and Parrotfish, which is a fair comparison, but it’s just not a high quality fish. In terms the preparation itself, it was overly marinated. 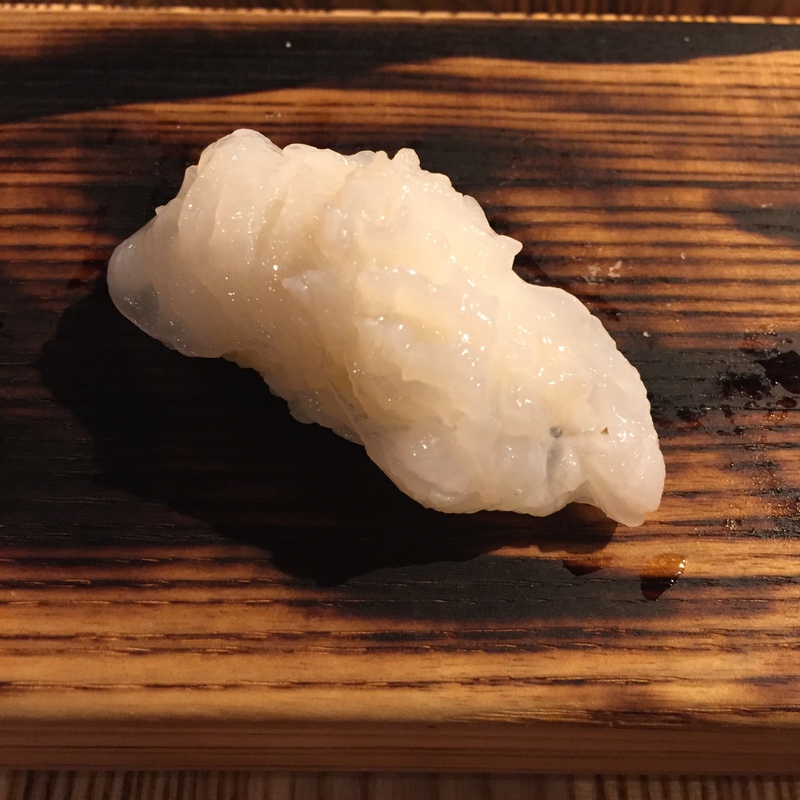 I love whites treated in Kombu, but ALL I tasted was Kombu. 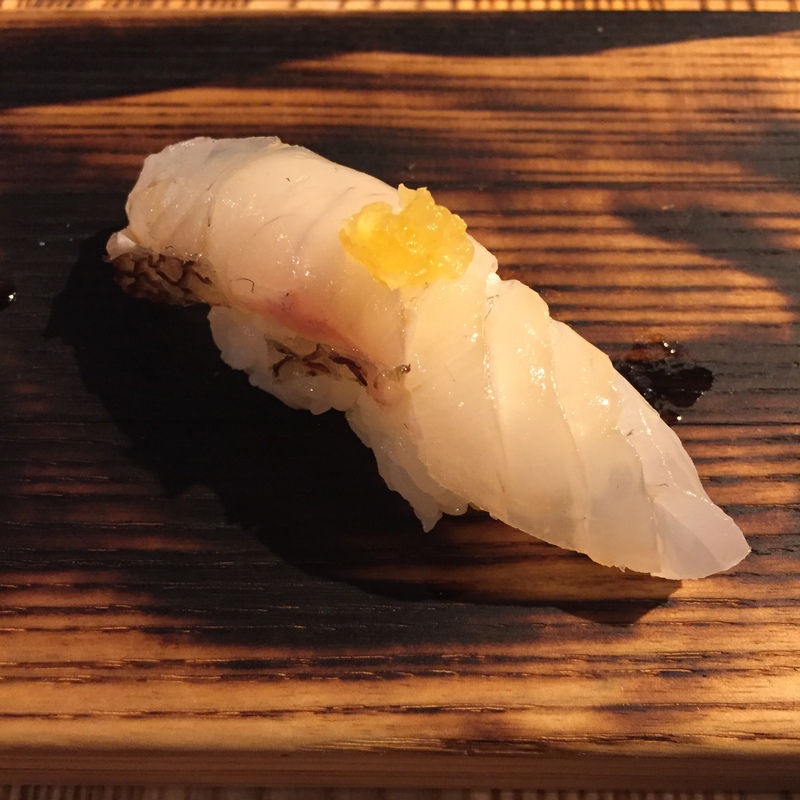 MADAI (Japanese seabream) – First time having my MADAI served with orange zest (as opposed to other citrus such as yuzu, lemon, or lime). Different. Good different. 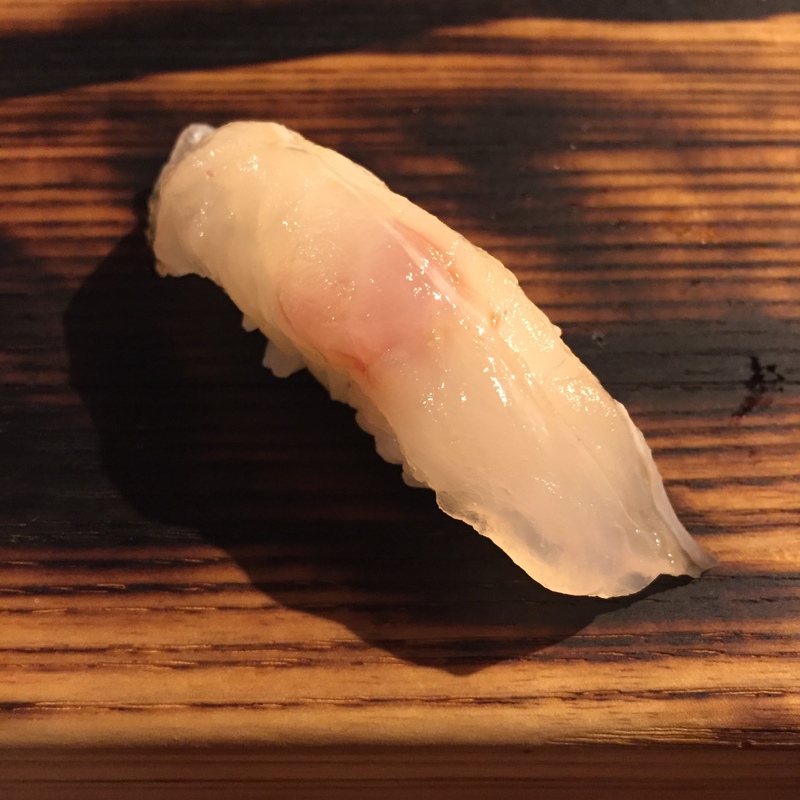 KISU (Whiting) – Loved the freshness, the texture, but again overly marinated in Kombu. 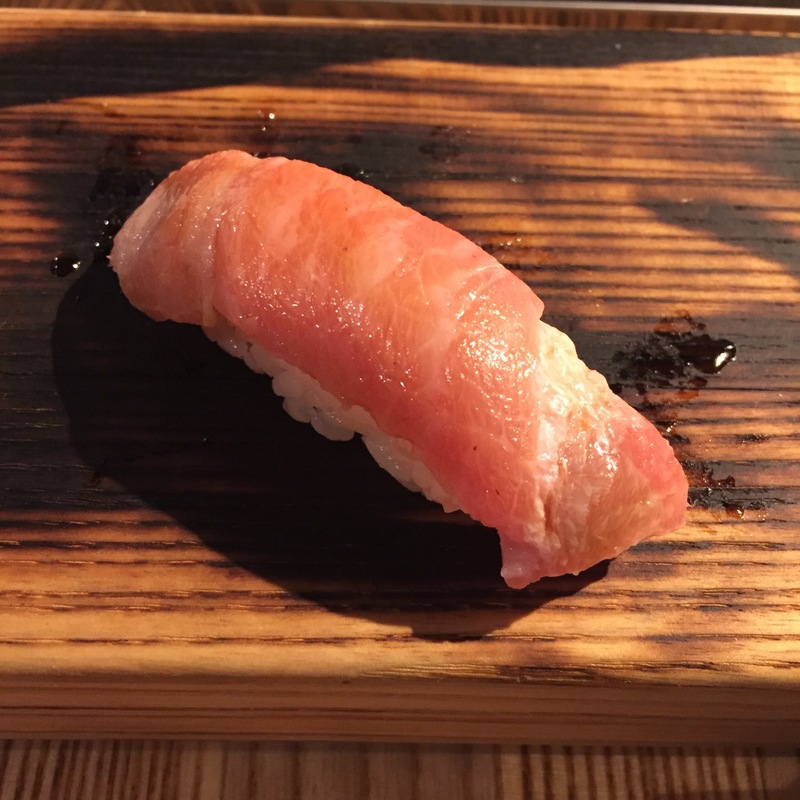 CHUTORO (Medium fatty Tuna) – Served very slightly ABURIed, this had great flavor. Only problem? A ginormous vein smack in the middle of the cut, made the piece super chewy. Sorry Chef David, but this is a cutting issue. 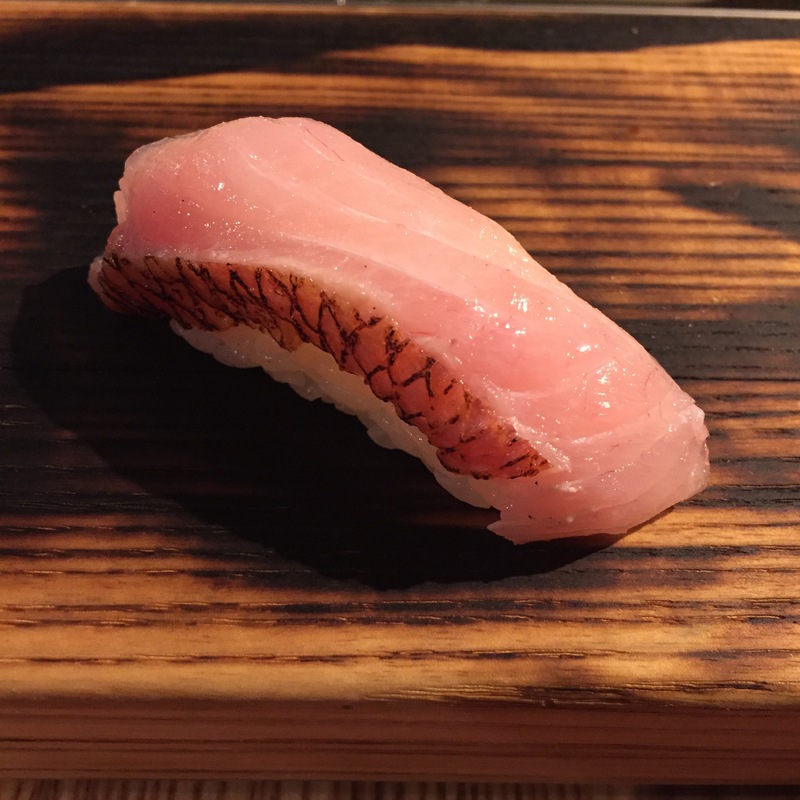 OTORO (Super fatty tuna) – Great flavor, no chew, and no funky aftertaste. This was good! 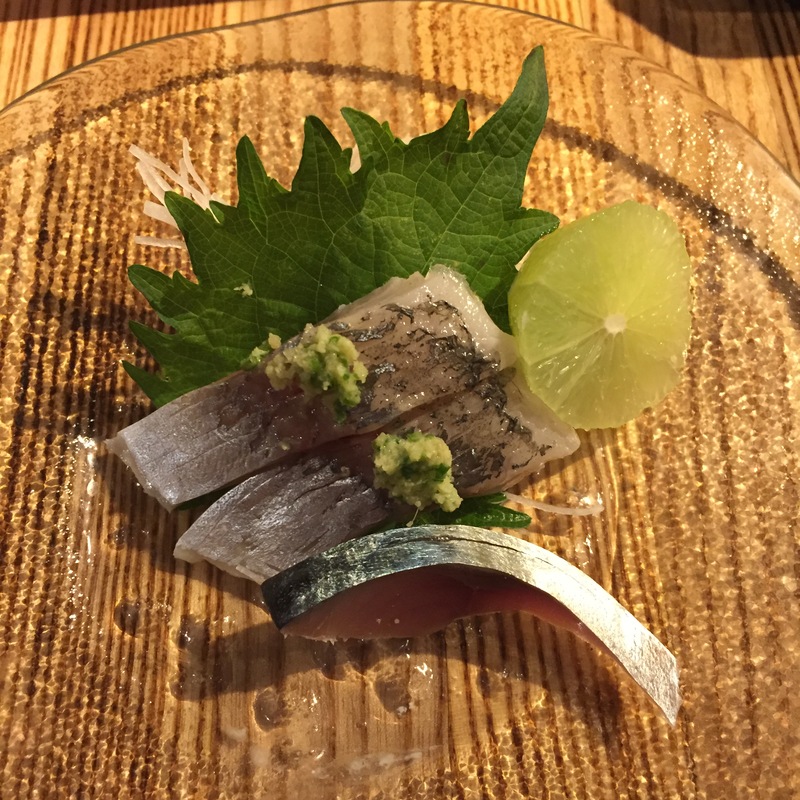 AJI (Japanese horse mackerel) and SABA (Japanese mackerel) – The two in the back are AJI, the one in the front was SABA. I’m not a fan of SABA in general, but this one was less fishy than most, still not a fan, but not completely turned off either. Chef David said that this was line caught, which is supposed to make a big difference. The AJI was great! 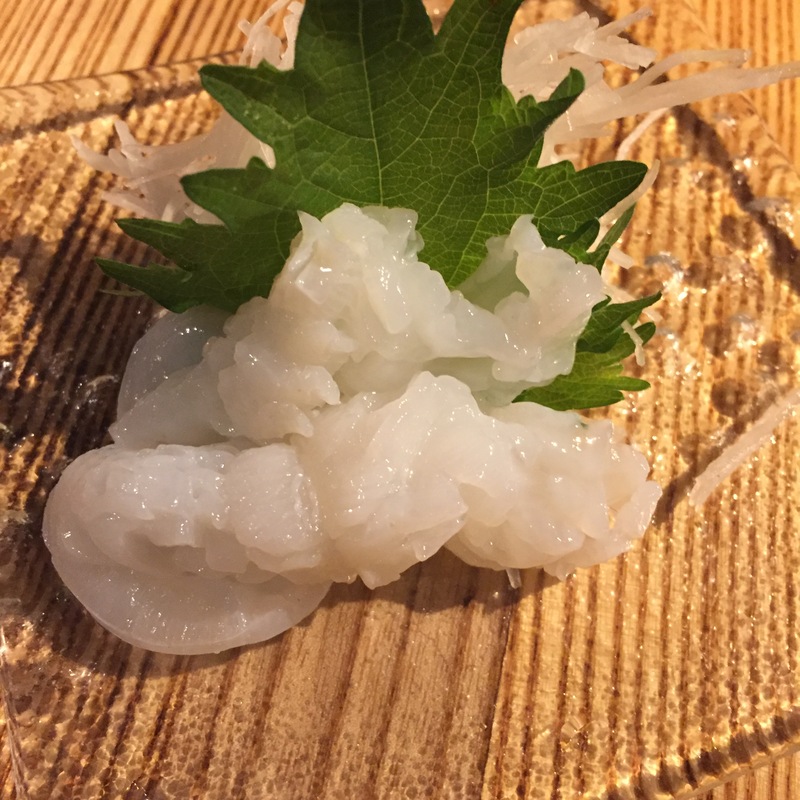 SHIRO IKA (White squid) – I love when chefs serve IKA like this! Very, very, very yummy! 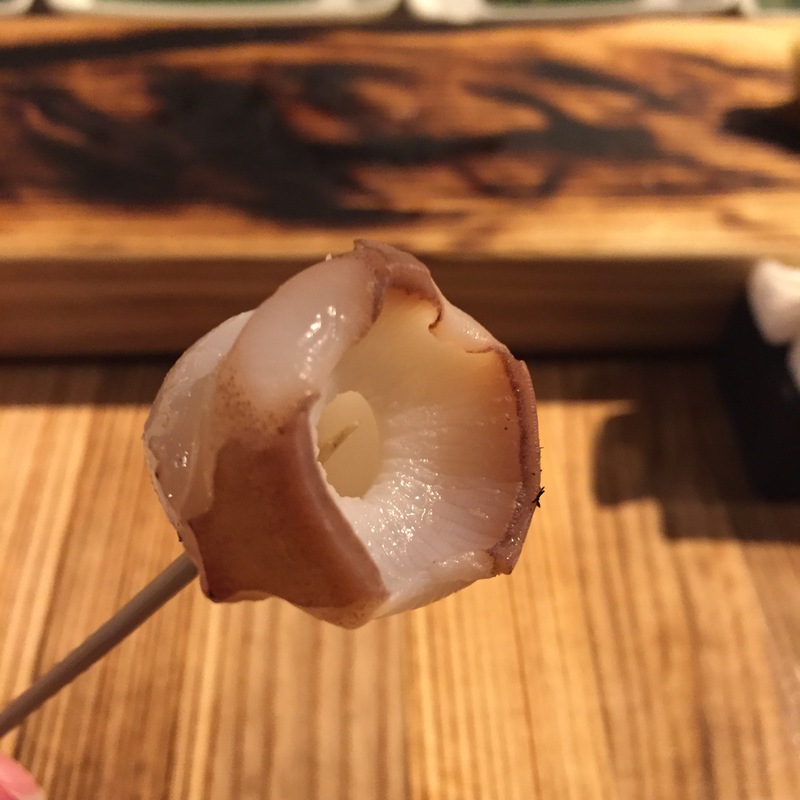 NAMADAKO (Live octopus) – YUMMM. I loved NAMADAKO, and this was cut very thin, and well scored to minimize chewiness. The tentacle was exceptionally good. Delicious! 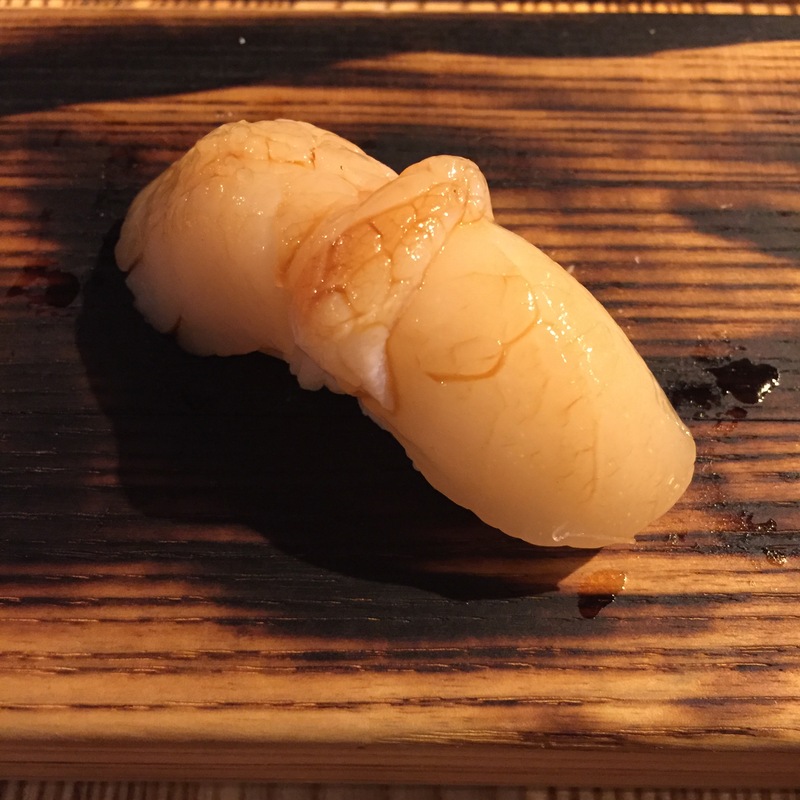 HOTATE (Scallop) – This was fishy, but at least Chef David didn’t try to mask it was citrus. Really hate when chefs do that. Scallop is widely available in the U.S., so there is no excuse! 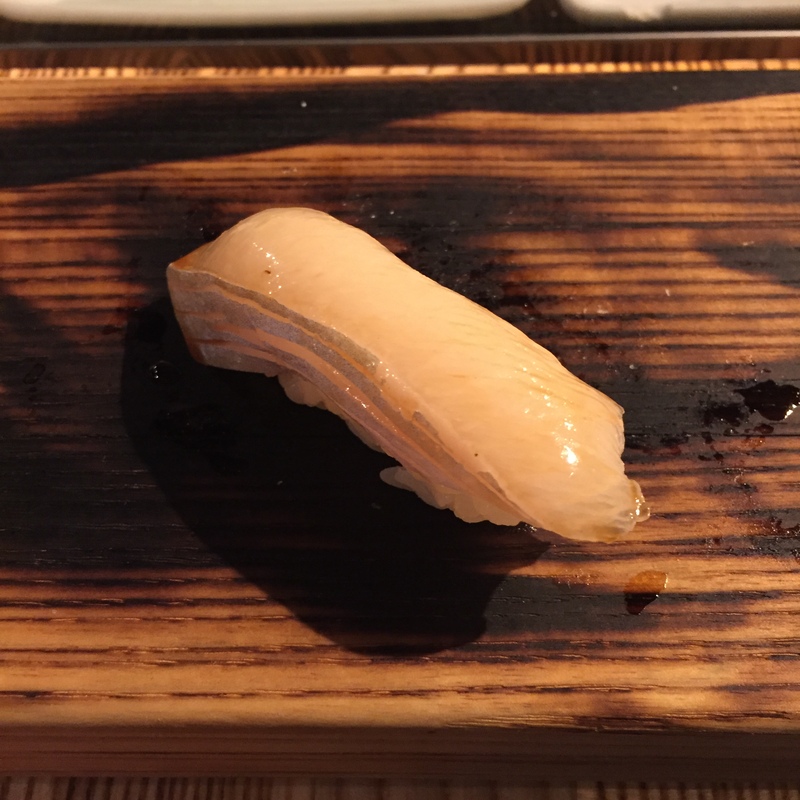 SHIMA AJI (Striped jack) – Great bite, still very firm, and very flavorful. Very good! 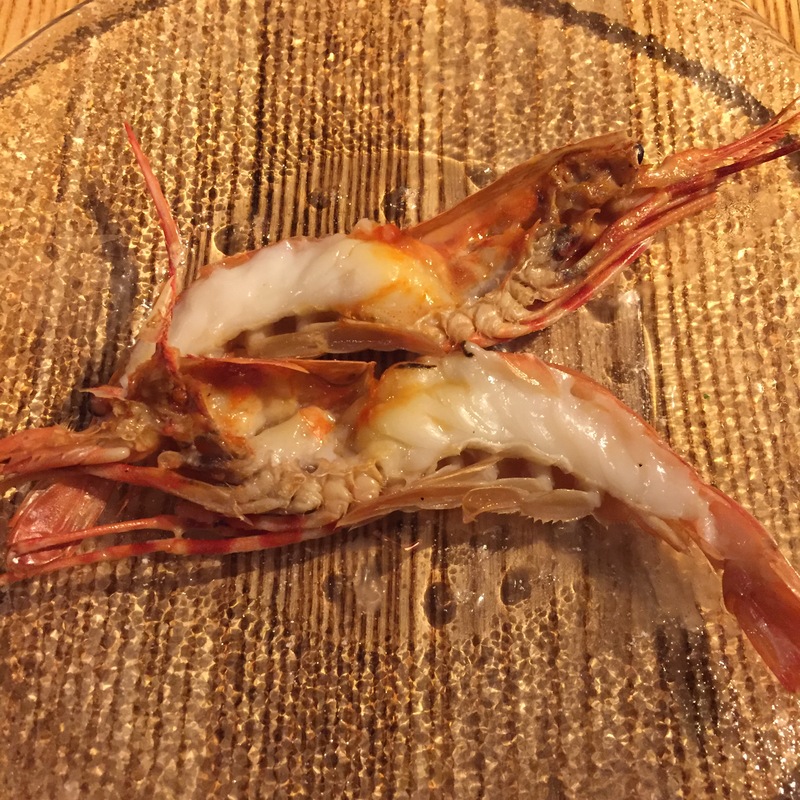 Grilled Shrimp – Chef David didn’t have live EBI of any sort, but he did serve us this grilled one. Still very, very tasty, but as usual, I prefer raw. 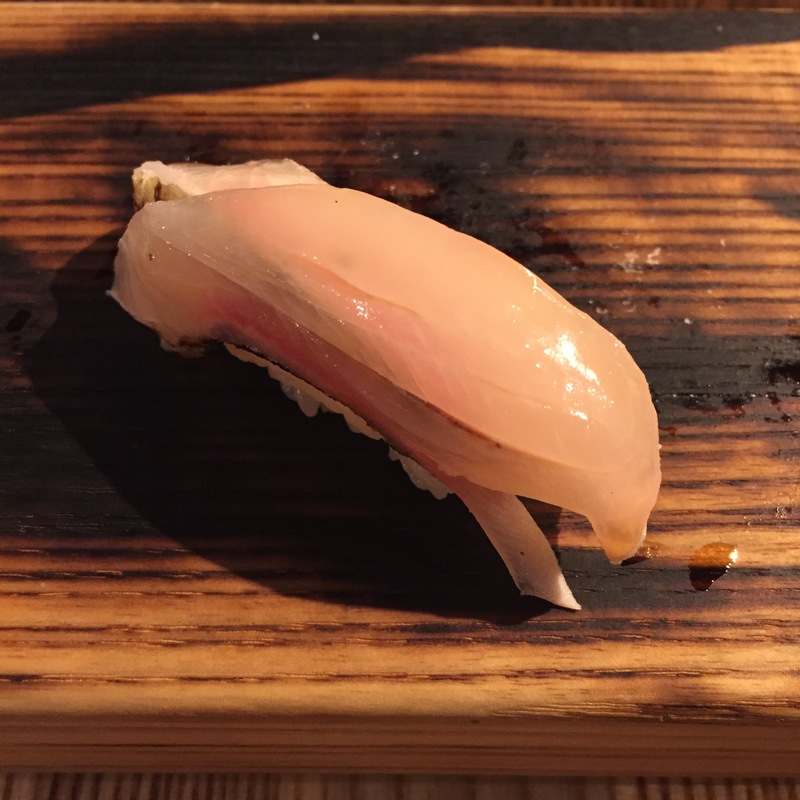 HAMACHI-SUNAZURI (Young yellowtail belly) – A boring fish for omakase, but still very good! 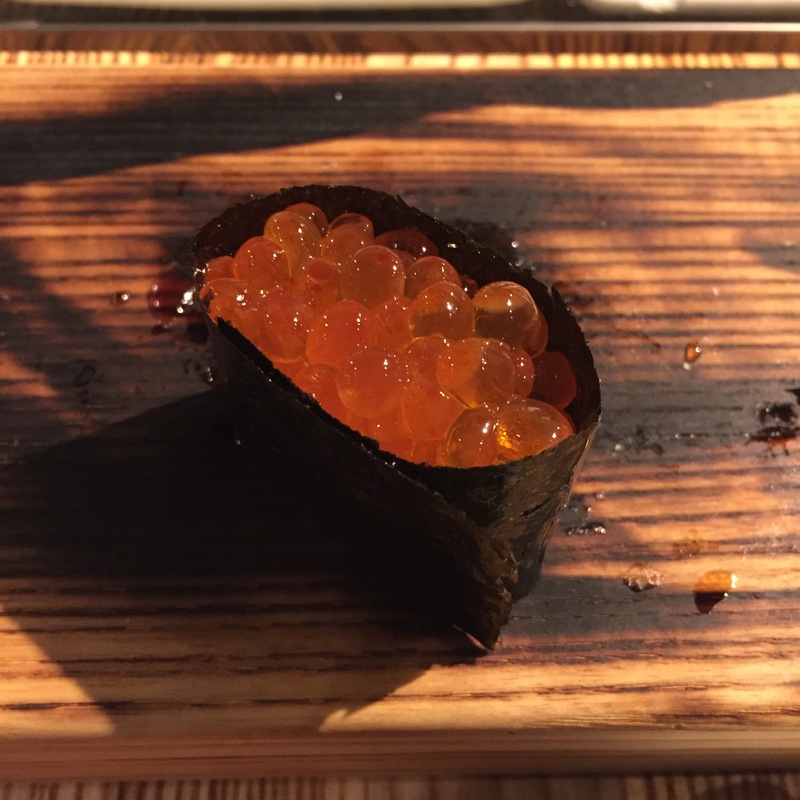 IKURA (Salmon Roe) – Great big, uncrushed, firm pearls, but marinade didn’t quite cut the mustard. 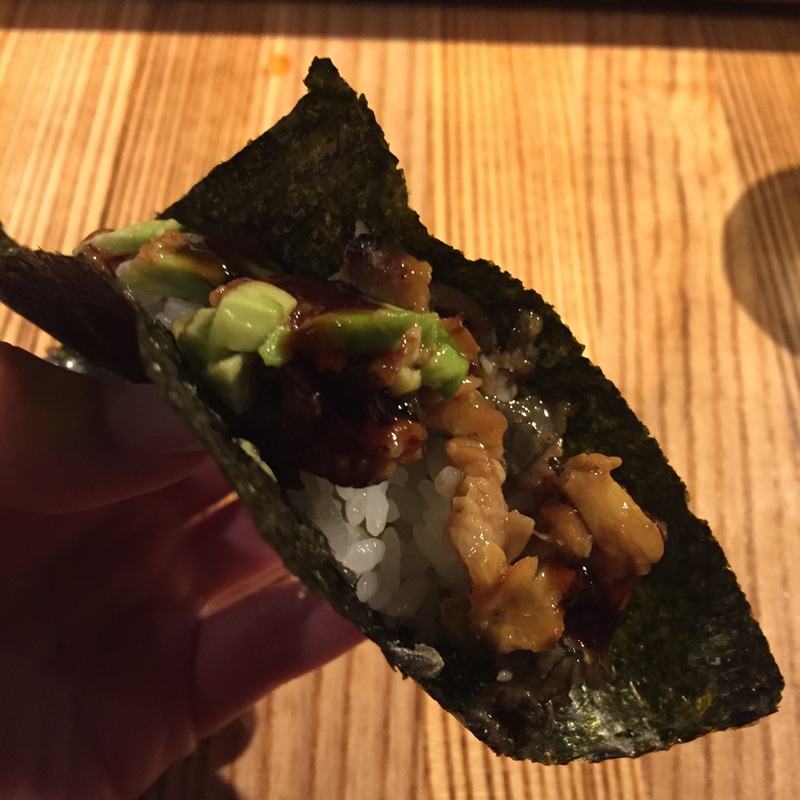 UNAGI Avocado – I blame myself for this serving. 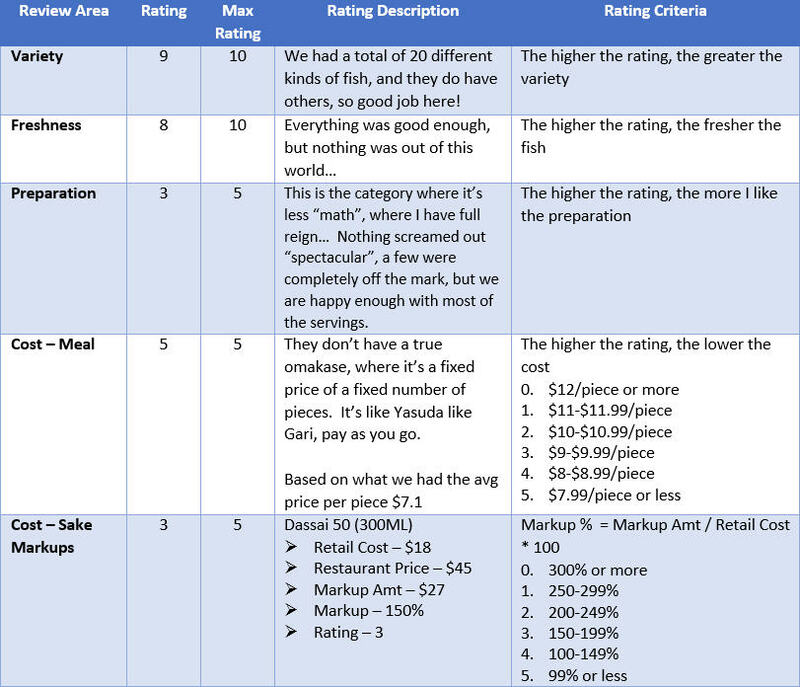 I did not specify to the chef that I do not enjoy UNAGI. I took one bite, but did not finish it. 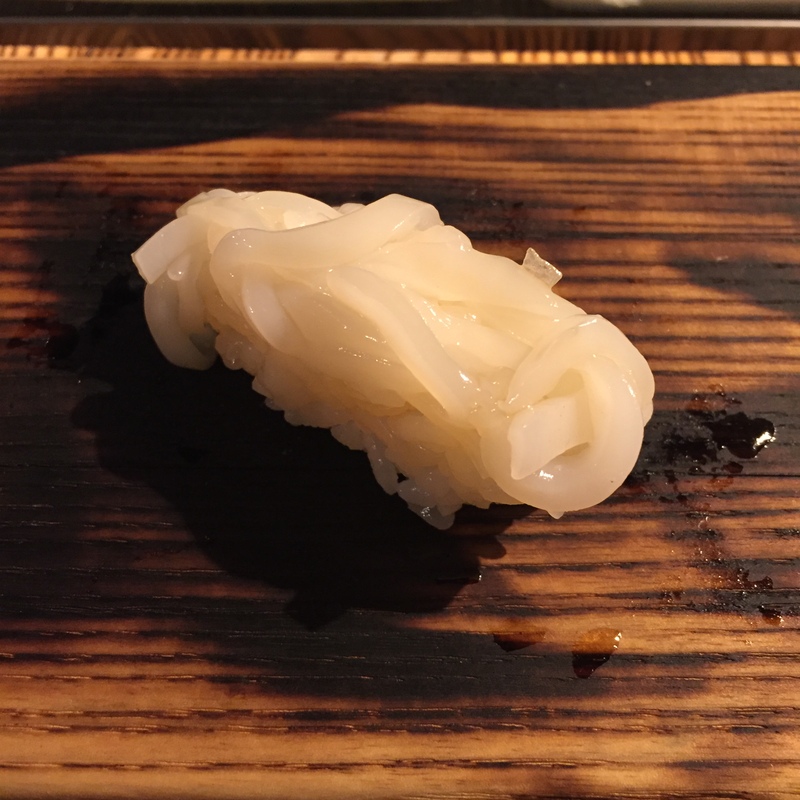 NAMADAKO sashimi (Live octopus) – Final round is always my repeat of most favorite serving! Fact is, Orlando sushi is not going to compare with NYC sushi, even if it is Disney. 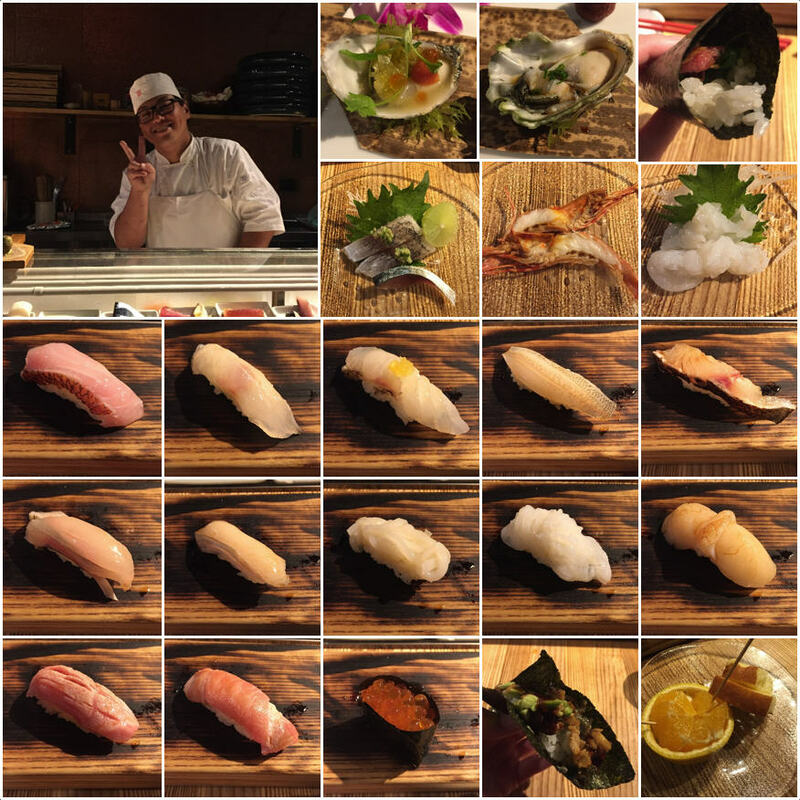 But if in Disney World, and feeling a sushi urge, the only place for respectable sushi is Morimoto. We will most certainly be back!